We’ll start this Ocean Reef Aria review by saying that this product is pretty affordable considering how versatile it is. The thing that makes it worth your while is its full-face design which provides you with a panoramic field of vision. The lens is bent so that there’s literally nothing obstructing your view. This, in turn, allows you to have a clear 180-degree view in front of you. In case you have a more pressing question, feel free to use the navigation below. Otherwise stick with us for the whole review of this mask model. You got nothing to lose anyway (well maybe except your interest in traditional snorkeling masks). So what makes the Ocean Reef Aria truly Stand out amongst it’s competitors? Are There Any Downsides to Using a Full-Face Snorkeling Mask? Is It Difficult to Learn How to Snorkel? Unlike traditional snorkeling masks, Aria lets you breathe normally – through your nose, rather than making you breathe through your mouth using the snorkel tube. As a result, you are guaranteed to feel much more comfortable while exploring the underwater universe. Another great thing about Aria’s design is that its breathing circulation system ensures no fogging can ever happen. What this means is that this masks will provide you with a clear view no matter what. Aria features adjustable straps, making this mask very comfortable to wear, regardless of your head size. Furthermore, you’re bound to feel proud wearing this masks on your head as Aria’s design is pretty attractive. Surely, beauty is in the eye of the beholder, but no one can deny that the Ocean Reef Full Face Snorkel Mask doesn’t look amazing. And even if you don’t like the standard blue version of the mask, you can choose some other color – grey, orange, pink, dark blue, black, or white. It wasn’t, after all, a coincidence that this model made it to our list of best full face snorkel masks. It’s also not a coincidence that this model has amassed over 300 reviews and an average rating of 4.5 on Amazon. Probably the biggest advantage of Ocean Reef aria full face snorkel mask is the fact that it does not fog. It’s design is such that it takes care of the air circulation on its own, making anti-fog products completely obsolete. Furthermore, the breathing system of the mask also keeps the exhaled CO2 away from the fresh air that you need to breathe in. In terms of safety, this mask is actually one of the best models out there. 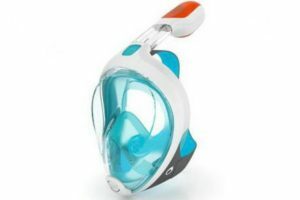 It’s not a coincidence it made it to our list of best kids full face snorkel masks, together with the WildHorn Seaview and Triboard Easybreath models. 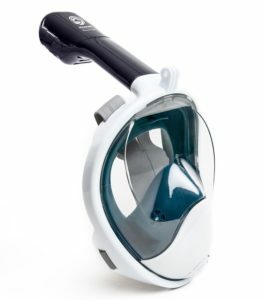 Another thing that makes Aria stand out from the competitors is the fact that it features a specially-designed dry snorkel. This tube does exactly what its name suggests – it stays dry even if you submerge it in water. This is because there is a floater inside the snorkel which closes the air hole as soon as the water comes in. And if the water comes in not through the tube but through the mask (if you haven’t fitted it properly, for example), the drain valve will drain it out. · Made of thermoplastic, a material resistant to UV radiation, salt water, etc. On top of everything, Ocean Reef is also giving a warranty on this product, so if something goes wrong with it, you will be able to replace it. To make the warranty valid, you are required to register the product on Ocean Reef official website, right after the purchase. That’s right, Ocean reef stands behind any product bought from Amazon. While there are a lot of full face snorkel mask designs out there, the Ocean Reef Aria is distinguished by two key features. The first unique design feature of the mask are the chemical light holders on the snorkel. These make the Ocean Reef Aria the ONLY mask (traditional or full-face) that is suitable for sunset snorkeling. The second advantage comes from the authority of the Company itself, Ocean Reef. The Brand has been known to produce the highest quality of prescription lenses for snorkeling masks for decades. When they designed the Aria model, it was only natural to make it compatible with their already existing solutions. This is why, the Ocean Reef Aria is also the only full face snorkeling mask that can be transformed into a prescription mask. Spending the little extra money for the integrated lens is, in our opinion, totally worth it. Of course, our ocean reef full face snorkel mask review would not be complete unless we touched on the subject of downsides of using a full-face snorkeling mask. Well, compared to traditional snorkeling masks, Aria is definitely a much better choice. However, you should know that not even Aria can enable you to dive deeper than just a few dozen inches under the surface. Another problem with these types of masks is that they’re not an ideal choice for swimming. Even though Ocean Reef’s Aria mask is made of light materials, wearing it on your head while swimming will not gonna feel comfortable. There you have it, our thoughts on Ocean Reef Aria full face snorkel mask! At this point, you’re probably wondering what’s our final recommendation – take it or leave it? Well, if you’re up for an unforgettable snorkeling experience, buying a full-face mask is a must. Surely, any mask with such design is gonna provide you with an impressive view of the bottom of the sea, so what makes Aria stand out? This mask does not fog – that’s its biggest advantage. However, there are plenty of other reasons why this product needs to be on your shopping list. It’s easy to put on and very comfy to wear. The mask also keeps CO2 away from the air you are breathing in, meaning that it takes care of your health and wellbeing. This snorkeling mask also looks very nice, with different colors to choose from. Finally, Ocean Reef Aria full-face mask is pretty affordable, so you definitely should not have second thoughts on whether to buy it or not. This is a sort of investment that just needs to pay off! The Ocean Reef Aria Full Face snorkel mask comes in two sizes. It’s very important to pick the right size for your face since a mask that is too big or too small will cause the seal to break constantly and cause leakage. 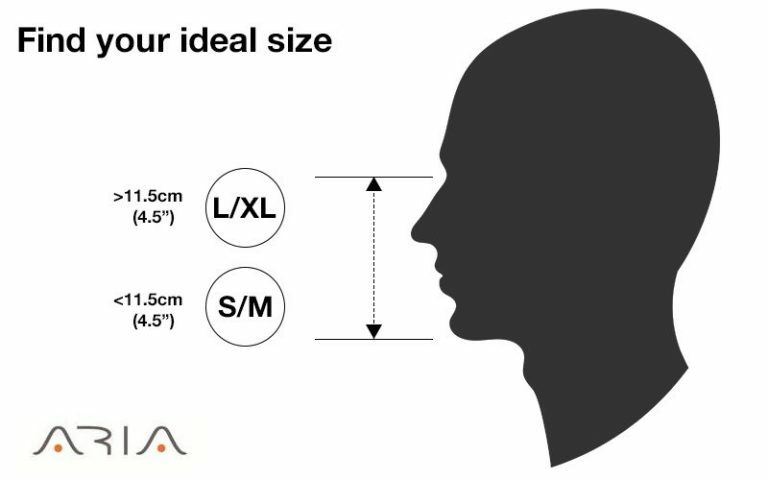 Luckily, the two sizes that Aria provides are ment to fit more than 95% of faces. In order to determine what size you should pick, you should first measure the distance between the bridge of your nose and your chin. If this distance is less than 11.5 cm (4.5 in) then you should go for the S/M size. If the distance is greater then you’re better off choosing the L/XL size. In case you’re confused as to how to measure the distance, please refer to the diagram below provided by Aria themselves. Ocean Reef Group is an American company with a history of more than half a century. It all started in the 1950s when Mr. Gamberini opened a tire-repair shop, which he used not just to help car and bicycle owners with their flat-tire problems but also snorkelers and scuba divers with the problems related to their equipment. At one point, he started designing diving masks and fins, which proved to be the best move of his career. Mr. Gamberini’s works quickly became super-popular among snorkelers, making his small shop grow to become one of the most reputable manufacturers of diving equipment. There are so many reasons why Ocean Reef is now one of the most trusted brands of snorkeling equipment. First of all, this company uses only the top-quality company to construct its products, which guarantees their sturdiness and durability. Still, the thing that really makes Ocean Reef stand out from the crowd is their everlasting creativity. This company is famous for constantly looking for new ways to improve the snorkeling experience, which is why they keep on launching new products. One of their inventions that really made a revolution in the world of snorkeling was the full-face mask. 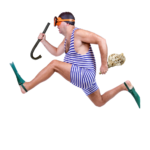 Ocean Reef snorkel mask is probably the most popular product of this company. There are different types of masks currently in the offer, but if you want the very best, the full-face snorkeling mask Aria is exactly what you need! Now that you know how awesome this activity is, you’re probably very eager to learn more about how to do it. Well, by definition, snorkeling is the practice of swimming under the water service, using a diving mask with a tube, which allows you to breathe without a break. The breathing tube is called the snorkel, hence the name of the activity. Speaking of the breathing tube, its length is usually about 40 centimeters (15-16 inches), as that’s about the maximum depth you can go without having difficulties with breathing. Actually, a longer tube would be useless. If you go deeper than that, the water pressure on your lungs will become so high that you won’t be able to breathe through the tube. What this means is that when it comes to picking the right snorkeling equipment, the size of the tube does not matter much. What is much more important is to choose a proper full-face mask. Such a piece of equipment can really take your snorkeling experience to a whole new level! Check out this Video Review, where the Ocean Reef Aria Full Face Snorkel Mask is recommended as excellent for beginner snorkelers and bad swimmers!